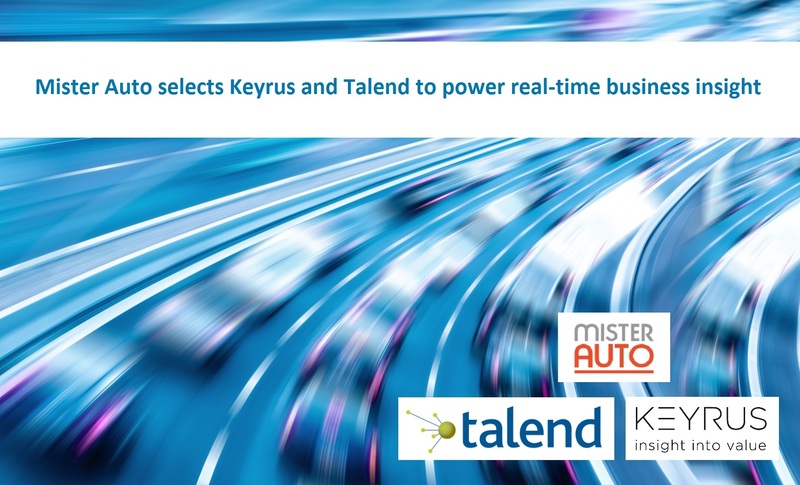 Keyrus, an international player in the fields of Data Intelligence, Digital, and Consulting on the Management and Transformation of enterprises, and Talend (NASDAQ:TLND), a global leader in Cloud and Big Data integration software, announce that Mister Auto, a top European online auto parts and accessories distributor, is using Talend Data Integration and Amazon Redshift to create and manage an analytics platform for a real-time view of its business. Keyrus, a Diamond partner in Talend's Value-Added Reseller (VAR) Program, piloted the deployment and guided the project's implementation and configuration. At Mister Auto, Talend manages a large volume of data from multiple sources, including data from the logistics and auto part businesses. Talend Data Integration helps feed the core of the data hub in the Cloud on Amazon Redshift – from analytical tools to many partner solutions (CRM, Datamining, forecasting, replenishment, etc.). The analytics platform enables all of Mister Auto's business departments to have access to the data and take control of their activities in real-time: sales indicators, analyses of purchase price and margin, logistics management, product availability and replenishment, as well as marketing offers. With its analytics platform, Mister Auto plans to develop new data marts to increase its understanding of its customers. "Talend's solutions give enterprises the opportunity to create a truly data-driven culture within their organization. Enterprises can thereby accelerate their decision-making process, develop competitive advantages, and create new sources of revenue", declared Vincent Hochart, Sales Director, General Business, at Keyrus. "After the success achieved with Mister Auto and many other projects over the past few years, we are naturally keen to strengthen our collaboration with Talend to assist our clients with their transitions towards a more data-oriented approach." For more information on Talend's portfolio of solutions, including Talend Data Integration, visit www.talend.com or the Talend blog.